It’s important broadcast videotape is properly evaluated before reuse, and for high definition stock it should be legally enforceable! Bulk erasing tapes, or laying black and burst on used tape, will not detect physical problems with tapes. The only way to detect such problems is to use evaluators – Orange Coconut use RTI TapeCheck Pro Line 4100 and 5100 evaluators. These machines remove loose oxide and dirt by cleaning and polishing the tape surface and use a laser to test the tape for physical defects and damage. This enables Orange Coconut to remove tapes from the system that fail the tests. This ensures customers only receive tapes that have passed these stringent tests. Without such evaluation, editors could be in a position where problems with a reused tape do not become apparent until near the end of a tape. 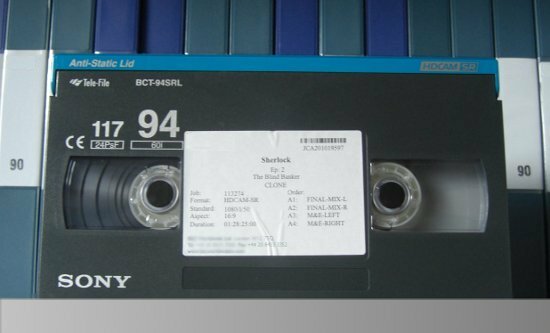 This would mean the edit would have to be repeated for the entire tape – something much more expensive than evaluating the tape before reuse. The Orange Coconut process also tests cassette shells for mechanical robustness, since all tapes are rewound using broadcast standard decks as well as in the RTI evaluators. The recent HDCAM SR tape shortage has increased the reuse of this stock. The tolerances of high definition tapes are much tighter than for standard definition tape. Since HDCAM SR uses the same width of tape as standard definition, technology has been pushed to its limits to accommodate the high definition signal, leading to the same issues that were applicable to D3 tapes, which, in their day, were also pushing the technology envelope. This means that all elements in the editing system need to be as good as possible, from correctly lined up machines to the highest possible quality tape. Using Oranges Coconut for tape evaluation also means that all fully evaluated videotapes are guaranteed to perform without failure on their first pass through video recording equipment. In the unlikely event of any videotape supplied by Orange Coconut failing to meet this performance standard, it will be replaced like-for-like free of any charge, subject only to the customer’s commitment to return the defective tape for technical assessment.